A detailed sculptured bird forms the main motif of the ‘Cluster Allure’ series along with natural semi-precious stones and Swarovski crystals. Bird motif necklace. The chain is embellished with various beads in shades of green, turquoise and brown. The bird is studded with Swarovski crystals. The bird measures approx. 3cm/30mm, and the beads measure 4mm up to 1cm/10mm. The front drop measure 7.5 cm/75mm. The necklace measures 18 inches/46cm to an adjustable 21 inches/53cm. Burnished silver plate. Bird motif necklace. The chain is embellished with various beads in shades of green, brown, purple and mustard. The bird is studded with Swarovski crystals in aqua blue. The bird measures approx. 3cm/30mm, and the beads measure 4mm up to 1cm/10mm. The front drop measure 7.5 cm/75mm. The necklace measures 18 inches/46cm to an adjustable 21 inches/53cm. Burnished gold plate. 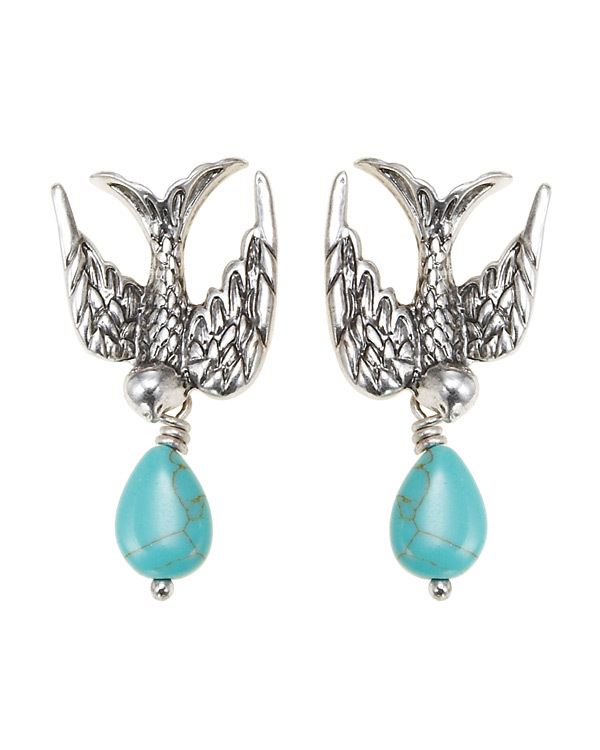 Bird motif earrings with drop of natural turquoise. The bird measures approx. 2cm/20mm. Total length 3.5cm/35mm. Post with bullet backing for pierced ears. Burnished silver plate. 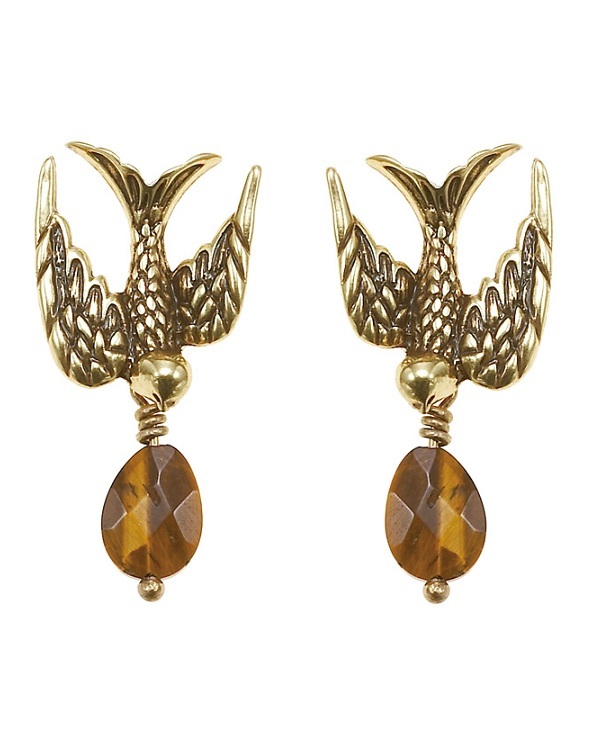 Bird motif earrings with drop of natural faceted tiger-eye (caramels browns). The bird measures approx. 2cm/20mm. Total length 3.5cm/35mm. Post with bullet backing for pierced ears. Burnished gold plate. 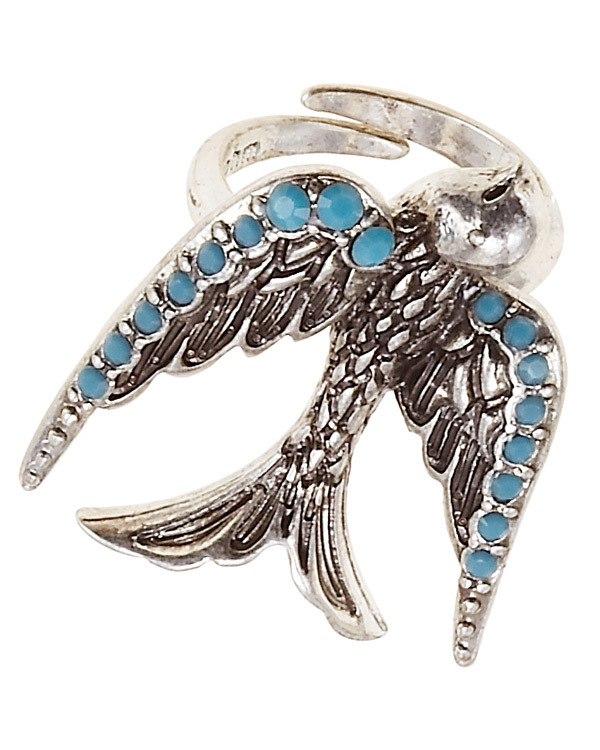 Bird motif adjustable ring. The bird measures approx. 2.7cm/27mm. The wings are studded with turquoise Swarovski crystals. Burnished silver plate. 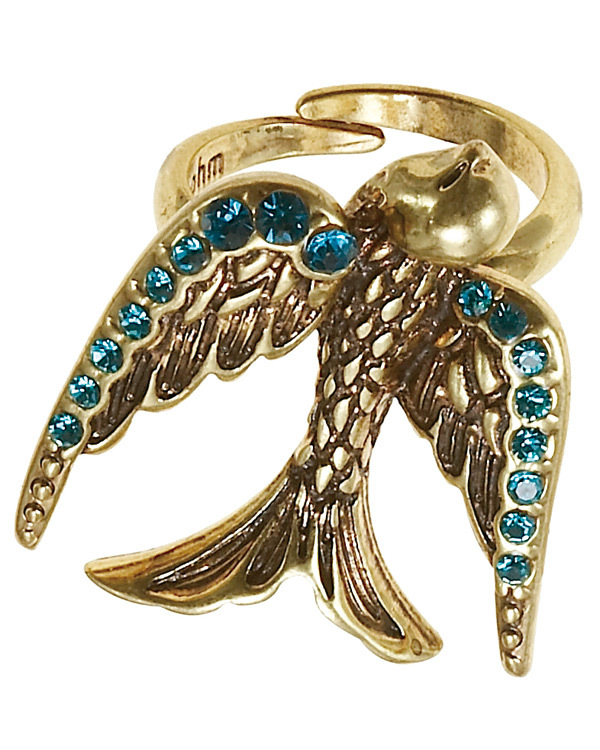 Bird motif adjustable ring. The bird measures approx. 2.7cm/27mm. The wings are studded with aqua blue Swarovski crystals. Burnished gold plate.